Every second car on the roads around Gothenburg seems to be a Volvo – perhaps not surprising given that the iconically Swedish company is based here. The little silver Volvo I’m gingerly piloting around the ice-crusted roundabouts is out of the ordinary even here, though, given that it’s one of just 27 pre-production all-electric C30 hatchbacks. Take the standard C30 four-seater and chuck out the internal combustion engine and fuel tank. Add an 82kW (110bhp) electric motor and 24kWh battery pack – with the lithium-ion cells arranged in two units, one under the boot floor, the other squeezed into the centre tunnel. Add in all the control electronics, chargers and voltage convertors, adjust the crumple zones and under-floor structures, and you have a rough recipe for the C30 DRIVe Electric. All told, it weighs about 280kg more than a petrol-powered equivalent but should be just as safe - Volvo has shown off the crash test results to prove it. Mains power goes in through the car’s nose, with a little plastic flap protecting the connector that is set within the front grille. But for that flap, and the lack of a tailpipe, there’s nothing to advertise this car as electric – aside from the garish graphics that all manufacturers seem to plaster over their pre-production electric vehicles. Inside, new clocks nestle in their binnacle behind the largish leather-trimmed wheel. 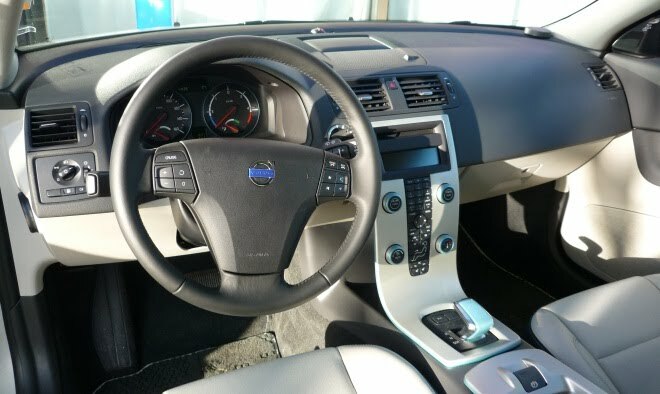 The instruments take a typically unfussy Volvoish approach to the job, requiring a double take to notice that they aren’t simply an ordinary speedo and tacho. To the left is the speedometer with an inset battery gauge. To the right, a large power flow meter swings either left or right to show instantaneous regeneration or discharge. A small trip economy meter is set within its orbit. At the top of the instrument panel, an oblong electronic display predicts the remaining range. The car takes an average of your consumption over the previous 30km, so a sudden burst of enthusiastic pedalling will take some time to filter through to a drastically reduced range forecast. 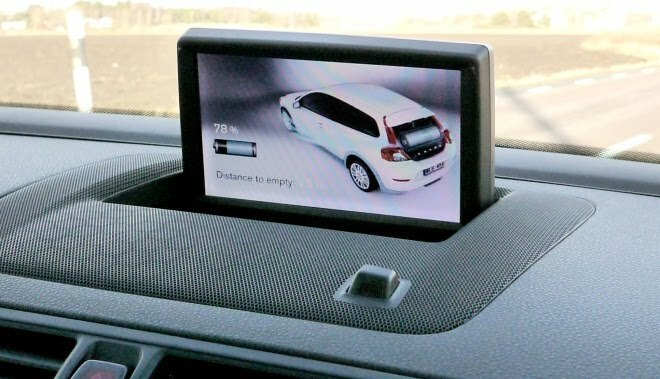 The main instruments are supplemented by a pop-up video screen, mounted above the centre air-vents, which can show animated graphics of power flows, presumably when not showing the satnav map. 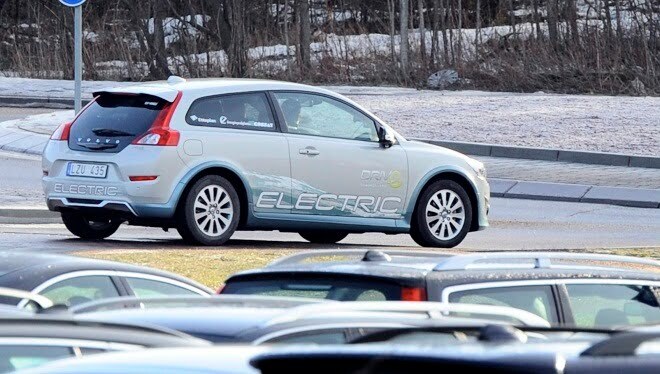 Annelie Gustavsson, product manager for the electric C30 and a passenger during my test drive, stressed that the display software isn’t finished yet. Eventually it will depict the impact of ancillaries on the car’s reserves. Switch on the aircon or seat warmers, say (both were fitted to our car), and the graphics will give you an instant estimate of their impact on range. To avoid freezing solid in the bitter Scandinavian winters, the car is equipped with two heating systems: an electric system that’s best employed to pre-warm the car while plugged in (there’s an iPhone app to control this), plus a liquid-fuelled heater. 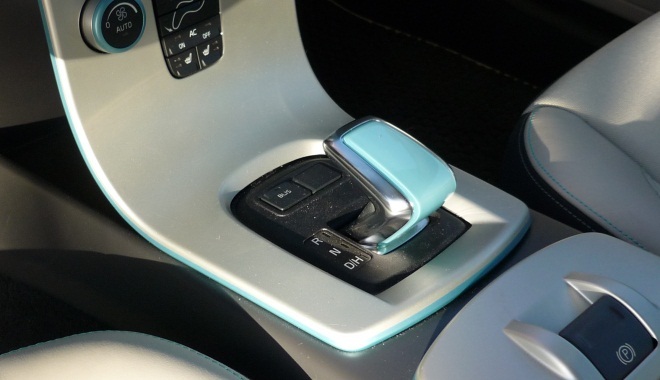 The interior is otherwise standard apart from bespoke blue trim on the minor controls, including the angular gear lever. This feels more like a joystick than a conventional automatic selector. Toggle forward for reverse, back again for neutral. Toggle back once more for drive, and back yet again to switch between D and H.
The batteries are good for up to 100 miles, allegedly, depending on driving style. Acceleration is brisk if you floor the throttle (and don’t have far to go). There’s a step in throttle resistance half way down to the floormat, to remind you that full bore will ruin your range. The car feels smooth and predictable as I steer, stop and manoeuvre, but I’m not inclined to find out what happens as you start to press on. Limits must remain unexplored given that I’m sitting on the wrong side of an unfinished car, on frost-damaged asphalt, with ice and snow lingering in the shadows, and with huge, rough-hewn boulders lining the road. I do get up to 90km/h (about 55mph) on a straight stretch, at which speed the C30 remains thoroughly refined. The suspension copes well with both scabby surfaces and long undulations. And it’s ghostly quiet - even the soft jet-turbine whine you’ll hear in other electric cars is largely absent. The C30 Electric is very easy to like, but don’t set your heart on one just yet. An initial run of 250 cars will be leased to paying customers starting early in June this year, but there are no current plans for a right-hand drive conversion or UK shipments. Most of the early cars will go to companies and public bodies, according to Annelie. I do hope that Volvo quickly moves on from its initial run to full production. The C30 feels like a very well engineered product, and it would give the Nissan Leaf some serious competition. The Leaf is more practical and currently does a better job of telling the driver how far they might drive, but the C30 is prettier and plusher and arguably more desirable. Assuming it can be sold at a competitive price, the little Swede might just be the most compelling EV I’ve sampled to date.